A letter from Frankie Samah, postgraduate student at the University of Bristol. Recently I read on a renowned charity website an article regarding the stigma attached to mental health in Muslim societies; that it is a ‘Western’ philosophy and that it simply doesn’t exist in Islam. 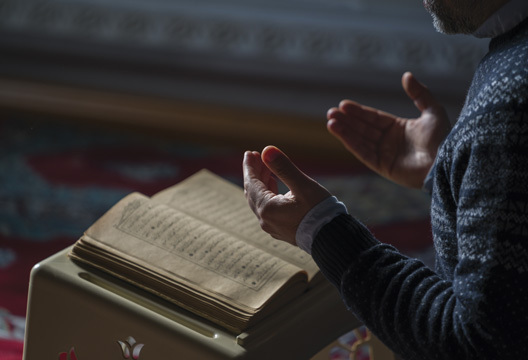 While I am not a scholar in Islamic theology, I wanted to address some of the misconceptions that are associated with the Qur’an and mental health as I understand it. Psychology in Islam is used in everyday practices but under different guises, such as spiritualism. Islam values the importance of good mental health and emotional wellbeing. The Qur’an can be used as a guide to those suffering from emotional distress and aims to lead people to a meaningful quality of life. ‘There is no disease that Allah has created, except that He also has created its treatment’ (Hadith). If we were to take an fMRI video of neural changes that happen in our brain when we are told the word ‘No’, we would see a sudden release of stress producing hormones and neurotransmitters. These chemicals immediately interrupt the normal functioning of our brain, impairing logic, reason, language processing, and communication. If the language is destructive or causes harm, the longer we are likely to ruminate on it. This can lead to damage to key structures that regulate our memory, feelings and emotions. This in turn will lead to disrupted sleep, a change in appetite and ability to feel happy. Each time we vocalise this negativity, more chemicals are released in our brain, increasing anxiety and irritability. This is the way cognitive neuroscience explains how destructive thought patterns and language can affect one’s mental wellbeing. Over a thousand years before Western psychology was constructed, the psychological language of the Qur’an described destructive emotions and harmful conditioning as nafs al-ammara or the commanding self. The Qur’an gives guidance to help overcome the inner turmoil that we can experience, caused by the nafs al-ammara and bring the peaceful self or nafs al-mutmainna into being. Islamic psychology or the science of the nafs is the philosophical study of the psyche or the mind from an Islamic perspective, which addresses psychology, neuroscience, philosophy of mind, psychiatry and psychoneuroimmunology. Due to the multidimensional use of words in the Arabic language, it’s difficult to translate into one specific word, but the word nafs lexically refers to our soul, the psyche, heart or mind. Nafs is used to indicate our own self or used as a synonym of Freud’s libido. The second way nafs has been used in the Qur’an is to refer to a specific part of our self that has desires, appetites. The Islamic concept of nafs highlights the intricate and complex composition of the inner self. Freud in the early 1900s described similar states as the id, ego and superego. The Qur’an describes the nafs, or self, as operating out of one of three states: nafs al-ammara (commanding self); nafs al-lawwama – accusatory self; and nafs al-mutmainna (peaceful self). The Qur’an explains how these states command our psyche and tell us what to do, they control us and dominate us. If we have nafs al-ammara, it means we are subjugated by the self, we listen and follow its commands. This stage describes the part of us that requires material possessions and sensual desires. With nafs al-lawwama we are conscious of our own imperfections and, inspired by our hearts, we see the results of our actions and our weaknesses and aspire for perfection. Finally, nafs al-mutmainna implies contentment and peace, there are no immoral desires. This is the ideal state of ego, there is tranquillity and peace. When our emotional needs are being poorly met, the nafs al-ammara begins to control our feelings, thoughts and behaviours. The Qur’an provides guidance to learn and practise relaxation exercises to weaken the influence of the nafs al-ammara. When it is in control, our thoughts are distorted leading us to take things personally, to see everything in a negative light and believe that things can’t be changed for the better. When our conscience, the nafs al-lawwama is active, we become aware that something is wrong with the way we are feeling and behaving. We can then learn to challenge negative thinking leading us to our nafs al-mutmainna. The Qur’an uses a technique called Alif-Lam-Mim for strengthening the nafs al-lawwama and help bring about a more peaceful state of being. Mindfulness is a modern concept, which emphasises a mental state of awareness, focus and happiness. Mindfulness is a way in which we can become more aware of ourselves, our thoughts and our feelings, and act in a way which is mindful of ourselves and others despite our nafs and desires. Furthermore, it is very similar to the main principle of cognitive behavioural therapy (CBT). CBT explores the link between thoughts, emotions and behaviour, which aims to alleviate distress by encouraging people to develop more adaptive cognitions and behaviours. CBT is the most widely researched and empirically supported psychotherapeutic method. There is a strong evidence base that is reflected in clinical guidelines, which recommend CBT as a treatment for many common mental health disorders. CBT ultimately aims to teach people to help themselves by understanding their current ways of thinking and behaving, and by equipping them with the tools to change their maladaptive cognitive and behavioural patterns. Or as the Qur’an says, to challenge negative thinking to bring serenity. These are just a few points to show how the Qur’an highlights the importance of psychological wellbeing. If we as a society are to move forward and remove the stigma associated with mental health, the first thing we should do is not emphasise unjustified prejudices and put more hate into the world. We should all push for the same common goal of love and humility in a place where people can live free from fear.